Juliet Lamont, the artist's grandaughter. Anonymous sale; Sotheby's, Tel Aviv, 30 May 1989, lot 48, where purchased by the present owners. Exhibition catalogue, David Bomberg in Palestine: 1923-1927, Jerusalem, The Isreal Museum, 1983, p. 48, no. 24, illustrated. 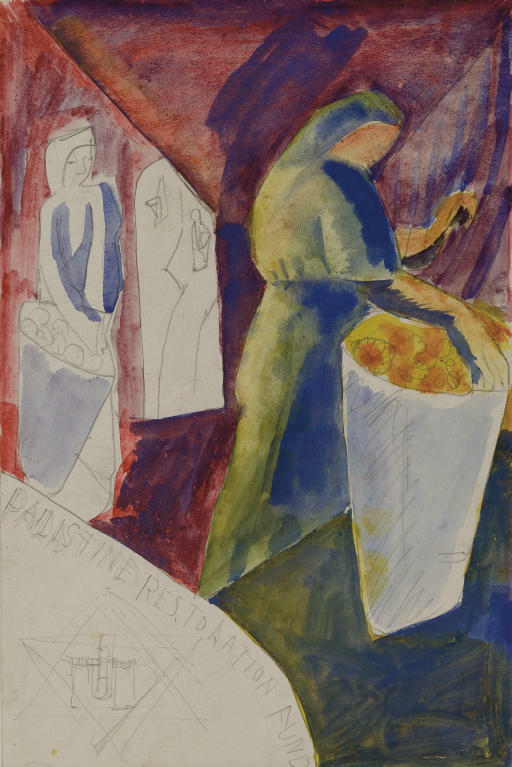 Jerusalem, The Israel Museum, David Bomberg in Palestine: 1923-1927, Autumn 1983, no. 24. Stephanie Rachum comments, 'There are also designs titled Palestine Restoration Fund Poster. It is unclear exactly when in 1923 Bomberg did these. The figures are similar to the work he was doing before he left England. Perhaps he executed them before setting out, as a means of showing the Zionist Organization the kind of work he could do, as they appear to be based more on what Bomberg heard about Palestine rather than what he actually saw there. The subjects of fruit pickers and the six pointed Star of David are foreign to his Palestine works and the posters themselves are not listed among the works which he shipped back to England from Jerusalem' (see Exhibition catalogue, op. cit., p. 30).